NB: Proffered as part of this Friday's Forgotten Books roundup. 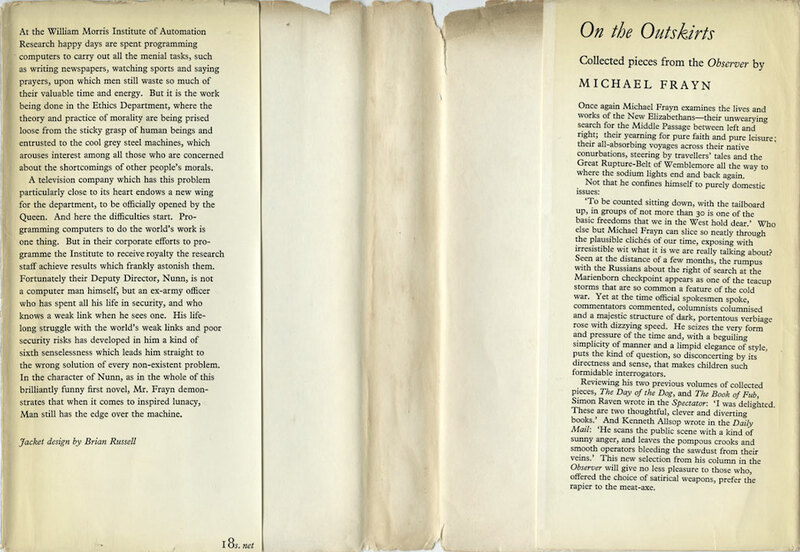 In his 2005 essay for The Guardian on novels about journalism, "Fleet Street's finest", Christopher Hitchens extolled the virtues of Michael Frayn's second novel, Towards the End of the Morning (1967), noting that it "used to have the status of a cult book among the hacks" and that it had "more or less everything". But Hitchens then ventured that "Admirers of Frayn's second novel are sneered at by those of us who are in the know, and who appreciate that it is his first novel about journalism that really demonstrates his genius." 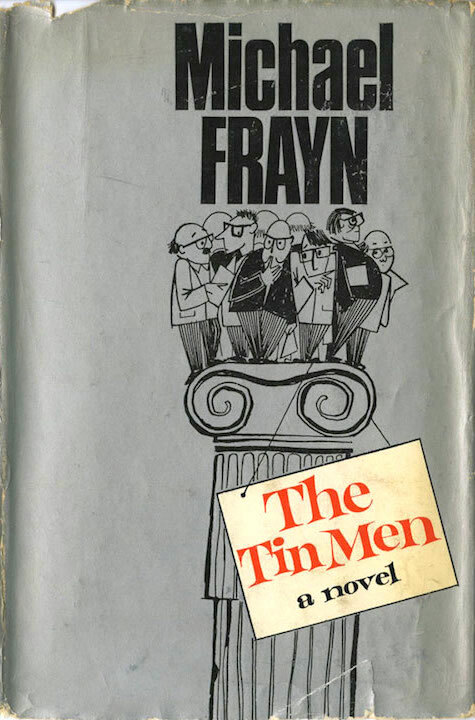 The Tin Men was first published in hardback by Collins in 1965 – actually Frayn's fourth book for the publisher; Collins had previously published three collections of his columns for The Guardian and The Observer (The Day of the Dog, 1962; The Book of Fub, 1963; On the Outskirts, 1964). I bought this copy of the first edition, with its rather battered silver dust jacket (designed by Brian Russell; I've added it to the Existential Ennui Beautiful British Book Jacket Design of the 1950s and 1960s page alongside Russell's other covers), in Any Amount of Books on Charing Cross Road last year for a fiver – something of an impulse purchase I suppose you'd call it, based on my having read and loved Towards the End of the Morning in 2012 and knowing that The Tin Men too was about journalism (a subject that's long been of interest to me, not least because I used to be a journo – of sorts – myself). ...Haugh had an open mind. It was open at the front, and it was open at the back. Opinions, beliefs, philosophies entered, sojourned briefly, and were pushed out at the other end by the press of incoming convictions and systems. Lamarckism, Montanism, Leninism, Buchmanism, Kleinism, Spenglerism – they all blew in with the draught, whirled cheerfully around, and sailed out again. It depended on who had spoken to him last. On Tuesday morning he would meet a man who believed in acupuncture, cheap money, and hand-blocked Victorian wallpaper, and throughout the day he would go round with the sort of quiet, sincere devotion to these ideals that would clearly withstand torture and martyrdom. But on Tuesday evening he would meet a man who pointed out that there were certain elementary logical flaws in the idea of acupuncture, cheap money, and hand-blocked Victorian wallpaper, and on Wednesday he would be radiant with a gentle pity for all those naive and credulous souls who had been taken in by them... He was a profoundly modest man, and in his modesty he knew that since he had evidently been wrong so often in the past, he was in no position now to cast stones at any idea, however wretched, or to refuse to take it in and give it shelter. Incidentally, I was on the train the other Friday, coming back from London – I'd been up in town for The Art of Neil Gaiman launch that evening – and sitting around the same table as me were three slightly pissed teenage girls. I was minding my own business, reading my first edition of The Tin Men, when I noticed one of the girls was blearily studying the back of the book. She looked at the quotes on the back for quite a while before muttering, "Michael Frayn. We did some of his at school." Guessing that she meant some of Frayn's later work – I think Spies (2002) went onto the syllabus in 2006 – I reported that I'd only read some of his early stuff, which I liked, and asked her what she thought of what she'd read. She gave me a small drunken smile and said, "Bit boring." I loved the story about the stranger on the train. I know exactly how you felt. 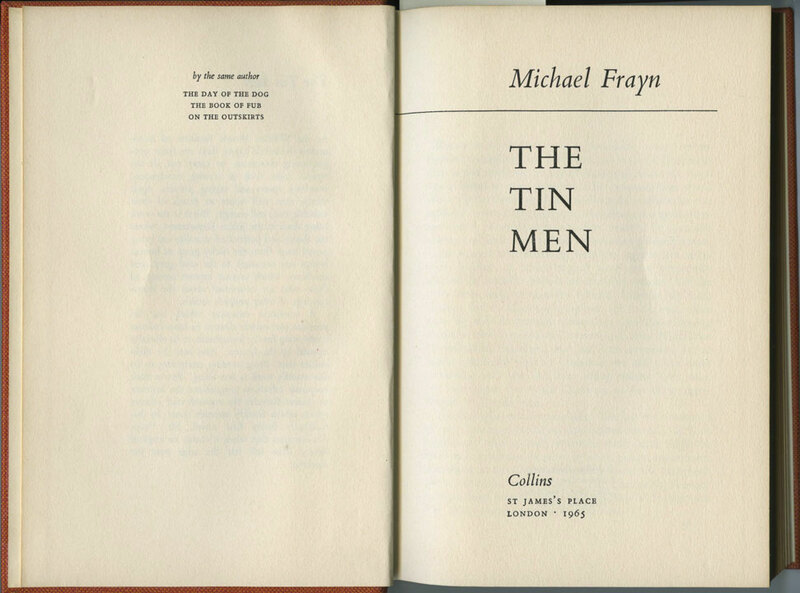 I don't own and haven't read The Tin Men but I have been looking at American copies of the hardcover on eBay (and think I prefer the American cover art). Maybe I will finally take the plunge. I do own an American first of Now You Know but haven't read more than a few pages of it. 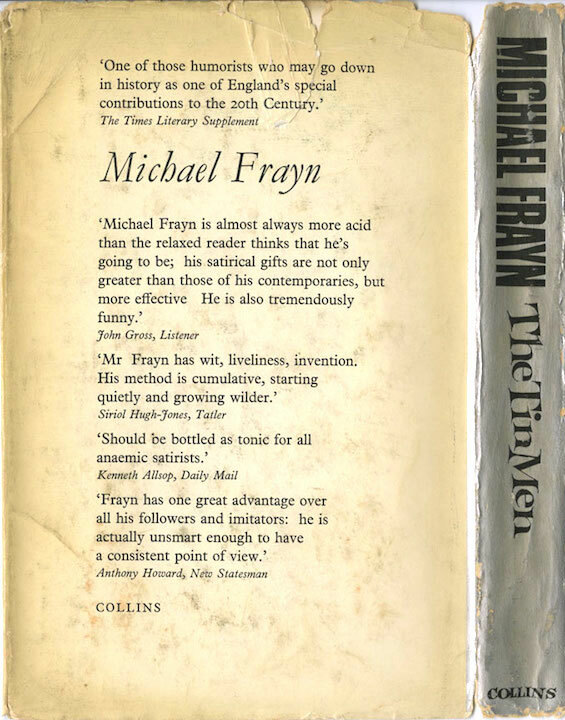 I am 0 for 2 this week on Michael Frayn. Spies is very good but not typical Frayn funny. Headlong is amazing, an all-time favorite of mine. And Skios I enjoyed but it has some flaws (which I could forgive while reading it because I like Frayn so much and wanted to enjoy the unfolding farce). And coincidentally, I have been reading Frayn's memoir of his father, My Father's Fortune, and his daughter Rebecca Frayn's second novel, Deceptions. I aim to be a Frayn completist. I still have Spies and will read it again because I thought it so good. What else do you recommend I read by Michael Frayn? I have to concur with Book Glutton. Headlong is hilarious, just a non-stop farce that keeps topping itself. Actually it's the only thing by Frayn I've read but it's genius. There you go, mum: two Headlong recommendations. And I'd recommend Towards the End of the Morning; I think you'll like that one.